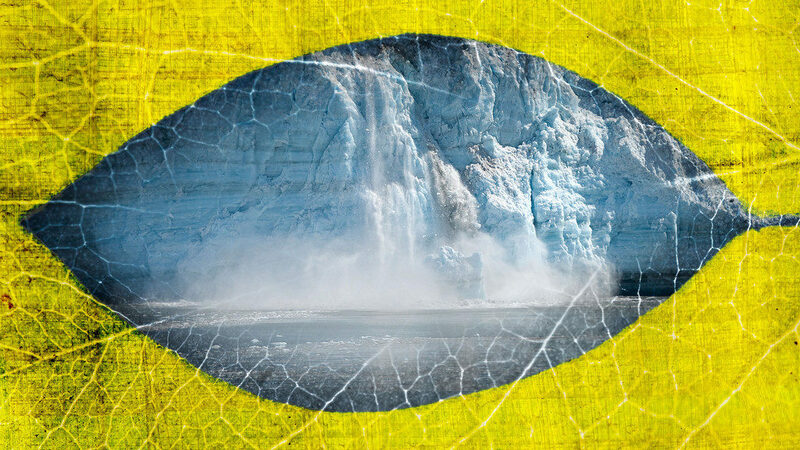 The planet is on the cusp of an environmental disaster due to man-made, carbon-emission-driven climate change. In order to mitigate the damage, all stakeholders need to act with urgency in order to reduce humanity’s carbon footprint to a minimum. While governments and corporations may possess the tools and leverage to organize such a transition, let’s not forget that this crisis is the product of our individual choices, and each one of us must contribute to solving it. There are 7.7 billion people currently alive on this planet, and they all contribute to global warming — some to a much higher degree than others, generally directly proportionately to their wealth. A recent study looked at a broad range of lifestyle choices and computed how much emissions would be removed from the atmosphere if they were replaced, changed, or done away with altogether. 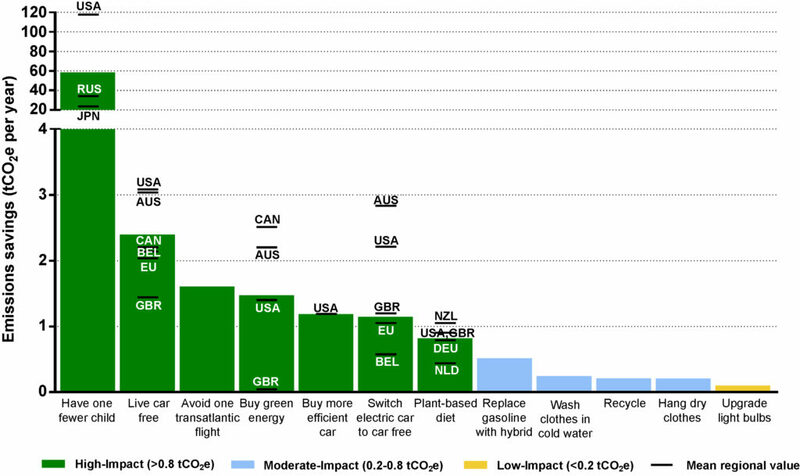 According to the results, the most high-impact actions that any person can take to significantly remove their carbon footprint is to have one fewer child, live car-free, avoid airplane travel, and turn vegetarian, in this order. In December 2015, 195 nations signed the historic Paris Agreement — an international pact whose ultimate goal is to limit global average temperature increase to ‘well below 2°C’. Almost four years later, the world seems still far away from the path required to reach this goal. The main driver of global warming is the combustion of fossil fuels for energy, so the obvious solution is to transition to 100% renewable energy as soon as possible. But progress is slow, and most carbon reduction targets pledged as part of the Paris Agreement assume that sometime in the future yet unproven technologies will help nations achieve their climate goals. The problem is that such a dramatic shift in infrastructure and policy cannot take place overnight. It often takes decades to accomplish. However, individual members of society can shift their behavior much faster than infrastructure can. According to a 2015 study, if we’re to avert a climate catastrophe, wealthy, high emitters who are responsible for nearly 50% of emissions might need to drastically change their lifestyle choices. Seth Wynes, a PhD Candidate at the University of British Columbia, and Kimberly A Nicholas, Associate Professor of Sustainability Sciences at Lund University in Sweden, argue that in the future people might need to “grow accustomed to a lifestyle that approaches the 2.1 tonnes per person annual emissions budget necessary by 2050 to meet the 2 °C climate target.” The two authors of the new study used a life cycle assessment approach — a technique that assesses environmental impacts associated with all the stages of a product’s life, from raw material extraction through manufacturing and distribution all the way to disposal or recycling — looking at 148 lifestyle scenarios from 39 sources. The authors focused solely on developed countries, specifically the USA, Australia, Canada, and the EU, due to the higher emission and consumption levels in those regions. The analysis identified a dozen individual actions which can have a positive climate impact, our of which they recommend four that offer the most substantial magnitude. These are: having one fewer child (an average for developed countries of 58.6 tonnes CO2-equivalent emission reductions per year), living car-free (2.4 tCO2e saved per year), avoiding airplane travel (1.6 tCO2e saved per roundtrip transatlantic flight) and eating a plant-based diet (0.8 tCO2e saved per year). A comparison of the emissions reductions from various individual actions. The authors of the study classified the actions as high (green), moderate (blue), and low (yellow) impact in terms of greenhouse gas emissions reductions. Credit: Environmental Research Letters. “While past research has focused on incremental behavioural changes that require minimal effort on the part of individuals, we propose to empower individuals to focus on changing the behaviours that are most effective at reducing their personal emissions. Many of these changes can be seen as desirable choices that promote a slower and healthier lifestyle,” the authors wrote in their study published in the journal Environmental Research Letters. The authors say that adolescents are the most prepared to make the shift since they have the freedom to make important behavioral choices that can structure the rest of their lives. Adults, on the other hand, have more inertia in life, which can make changing their lifestyle seem too much like a sacrifice. What’s more, the authors write, adolescents can also act as catalysts for change in a household. Of course, that doesn’t mean that we can’t all play an important role. Millennials are already willing to shift their lifestyles to be more environmentally friendly. Younger generations in the United States have lower car ownership and, at the very least, delay car use compared to older generations. They’re also more willing to eat less meat to become vegetarians. For instance, in 2014, 400 million fewer animals were killed for food because young Americans chose to eat less meat.